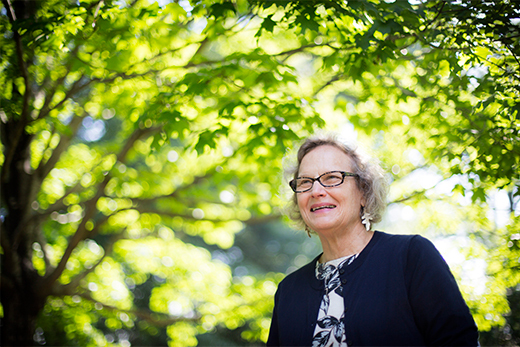 Lauded for exemplary teaching, Oxford College biology professor Eloise Carter also co-authored a landmark report that led to Emory's forest protection plan, launched a summer program to help K-12 teachers improve science education, and shepherded Oxford's new science building. Ask Oxford College biology professor Eloise Carter how she was drawn to study the natural world and she pauses, as if both considering her answer and savoring the thought of this, her life's work. "I often wonder that myself," Carter acknowledges with a soft laugh. In truth, the rolling, wooded hills of northwestern Georgia were her first classroom. With a mother who frequently sent her outside to play, "everyday life was spent climbing a tree or roaming about the woods," she recalls. "At the time, I didn't know that it was unusual." For more than 30 years, Carter has taken her love of experiential learning with her into both conventional classrooms and the fields and mountains of Georgia — her other classrooms — as a biologist, botanist, ecologist and educator. In recognition of her longstanding leadership and contributions to Emory's Atlanta and Oxford College campuses, as well as her impassioned commitment to undergraduate education, Carter received the 2016 Thomas Jefferson Award. The annual award, which was named and endowed by the Robert Earl McConnell Foundation, honors a member of the faculty or staff who has significantly enriched the intellectual and civic life of the Emory community. It was presented May 9 at the University-wide Commencement ceremony. Letters nominating Carter for the award enumerate many examples of how she has served both of Emory's campuses, including co-authoring a landmark report that would become the foundation of Emory's forest protection plan, launching a summer program to help K-12 teachers improve science education, and shepherding the planning and construction of a new state-of-the-art science building at Oxford College, which opened earlier this year. Yet it is her exemplary strength as a teacher that is cited time and again, earning praise from former students, faculty peers and administrators, who describe her as "a teacher of teachers." "Eloise is one of the absolutely best teachers I have ever seen in my own 27 years of university and college teaching," writes David Gowler, Oxford College Pierce Professor of Religion, in his letter of recommendation. "Students are always first and foremost in Eloise's mind and work," he writes. "They gravitate to her dynamic and inquiry-driven courses, and her enthusiasm for learning and knowledge is contagious." Hematology and oncology professor J. William Eley, executive associate dean of medical education and student affairs and graduate education for the Emory School of Medicine, recalls being taught by Carter when she was an Emory doctoral student and teaching assistant in the 1970s. "Dr. Carter, albeit a graduate student at the time, was already a fantastic teacher," he recalls. "She remains a great leader in science education at Emory; her students who join us at the School of Medicine hold her in the greatest esteem." Her gifts as a teacher have won her many honors. In 2004, Carter received the Emory Williams Teaching Award, the University's highest recognition for excellence in teaching. She has also received both of Oxford's teaching awards — the Fleming Award in 1997 and the Mizell Award in 2008. "I am constantly stunned by the level of energy that Eloise brings to her teaching, research and service," writes Margaret McGehee, associate professor of American Studies at Oxford College, "energy that is contagious among her colleagues who, after spending just a little time with her, want to be better teachers, servants and stewards of the environment." Helping students "see the world differently"
Carter first came to Emory after graduating from Wesleyan College in Macon, Georgia, to work as a research technician with the National Pituitary Agency studying pituitary hormones. Using Emory's courtesy scholarship, she earned a master's degree in biology in 1978. She went on to earn her PhD in biology in 1983. While pursuing doctoral studies, she also taught biology at Agnes Scott College. From 1984 through 1988, Carter was an assistant professor of biology at Emory, transferring to Oxford College in 1988, where she's taught popular classes — most have a waiting list — in biology and field botany, ecology and evolution for 28 years. Despite a long-held fascination with the natural world, Carter didn't intend to become a biologist and never imagined becoming a professor. But an innate skill with engaging students in the world around them made teaching a natural fit. To this day, her greatest satisfaction is found in helping students "to see the world differently." "Students first come to my field botany class and they don't even see the plants in their world. By the end of the semester they are obsessed with seeing and identifying every woody plant on campus, which no doubt drives their roommates crazy," Carter says, laughing. Watching student conceptions of the natural world evolve through study and hands-on learning into something expansive and complex "is very exciting to me," she explains. "I'm always trying to figure out what question, what piece of information you can put in front of a student so they can learn things a little more deeply." John Wegner, a senior lecturer in Emory's Department of Environmental Sciences, witnessed those talents first-hand when he took Carter's field botany course about 15 years ago. "She opened my eyes to a different way of teaching," says Wegner, who has since borrowed from it. "The idea of teaching students to become sharp-eyed observers is something I've been using for over 10 years with my own classes." Wegner also came to know Carter through their work together on the University Senate's Committee on the Environment, where she was one of the group's most outspoken members, never shying away from asking "the really tough questions." In fact, her work with former Oxford College Dean William "Bill" Murdy led to what would become known as the Murdy-Carter Report, which documented the rich diversity of vegetation and hardwood forests at Emory, leading to both the University's first forest protection plan and the foundation of today's campus land-use plan. Reflecting upon what drives Carter as a passionate advocate for both students and the natural world, Wegner says, "It's her curiosity, her stewardship, her commitment." "In the classroom, I was impressed by both her vast knowledge and also her ability to say, 'I don't know,' which is refreshing in an instructor," he says. "There is a humility there. It's not like 'I'm the professor, you're the student.' It was more an attitude of respect, as if we're all in this together."